Psoriasis affects more than 6 million people in the United States. It typically appears in scaly patches on the legs, arms, knees, elbows, scalp, ears, and back. Anyone who suffers from psoriasis knows how frustrating it can be -- it generally follows a pattern of flare-ups alternating with periods of remission. It can be exacerbated by emotional stress, illness, too little or too much sunlight, or a viral infection. Autoimmunity is suspected as the core problem. Supporting the body from the inside out by reducing inflammation, improving digestion, and cleansing the blood will help heal the underlying issues with psoriasis. A variety of herbs may be helpful, taken internally or applied topically. Burdock: Burdock has been used for centuries to treat a variety of ailments. It helps to cleanse the bloodstream of toxins, and it has been traditionally used as a topical remedy for psoriasis. Look for burdock in herbal preparations and as an ingredient in topical products to help hydrate and soothe itchy, dry, irritated skin. Chamomile: One of the most popular herbs in the western world, chamomile isn't just for calming frayed nerves. 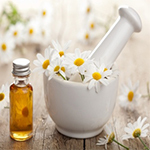 Chamomile helps support healthy digestion, an important factor in psoriasis, and in animal studies it has shown promise for relieving symptoms of skin conditions. Primrose oil: Primrose oil is a natural source of GLA (gamma-linolenic acid), a fatty acid that promotes healthy skin. It can be consumed in a supplement to treat psoriasis or applied topically to help soothe irritation and heal psoriasis lesions. Milk thistle: Silymarin, or milk thistle extract, helps to cleanse the blood, protects the liver, and helps regulate immune function, which are important for anyone with psoriasis. Curcumin: Curcumin, the active ingredient in turmeric, is a powerful anti-inflammatory that shows promise for minimizing psoriasis flare-ups. Look for curcumin in supplement form, in topical products, and if you're a fan of curry, add turmeric liberally to your food.